You can never have too many chargers around, and the Aukey 46W Type-C brick should meet most if not all of your needs. It can juice up laptops like the Pixelbook and MacBook as well as phones like the Pixel. It's on sale right now for $27.99, but this is an Amazon Lightning Deal—it's going fast. This charger has two ports; one Type-C with USB-PD fast charging and a standard USB Type-A port that tops out at 10.5W. The Type-C port can do a maximum of 45W with support for 5V 3A, 9V 3A, 12V 3A, 15V 3A, and 20V 2.3A. You can use both ports simultaneously if you've got a device that you don't mind charging slowly over USB. 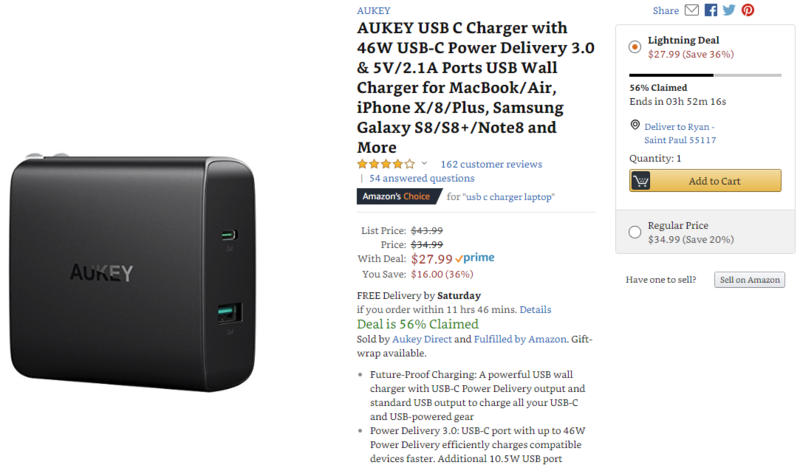 The Aukey charger is usually $34.99 on Amazon, down from the original $43.99 price. Today, it's on sale for $27.99. Because this is a Lightning Deal, it has both a time and quantity limits. It has about four hours left as of this posting, but more than half of the units are also gone. Don't wait too long on this.